Have you ever found yourself staring at two bars of chocolate and trying to work out why one is £1 and the other over £5? And if it’s really worth spending more? The aim of this post is to help you make an informed choice by giving you some insider tips on what to look for, and what to beware of, on a chocolate bar label. With many products, you can look at them and immediately see the difference. Roast chicken and chicken nuggets are clearly not the same thing. The same can be said for processed orange squash and freshly squeezed orange juice, processed cheese and artisan cheese. Unfortunately, when it comes to chocolate bars, the difference between industrial, mass-produced chocolate and craft, bean to bar chocolate is less perceptible – marketing tactics carried out by industrial chocolate makers masquerading as ‘artisan’ and better quality doesn’t help either. To make it simple, we’ve developed a five point checklist that should help you make an informed decision. Take a look at this Pump Street Chocolate bar ingredients label and you’ll realise how simple good quality chocolate really is. Vegetable fats, E numbers, artificial flavourings, soy lecithin, PGPR, Vanillin and Emulsifiers are all tell-tale signs of generic, mass produced chocolate. Take a look at the ingredients label below of a chocolate bar produced by a well known market leader. You’ll immediately notice a lack of actual cocoa. However, in craft chocolate, cacao will always take centre stage. Which actually helps explain why some of our chocolate makers often make a conscious decision to use sunflower lecithin. To reduce the viscosity of their chocolate, makers will add sunflower lecithin (rather than add too much cocoa butter) so the true flavour of the cacao bean is not masked. Furthermore, if you see bars with ingredients that read, for example: raw cacao powder, raw cacao butter, coconut blossom sugar – think twice. It almost resembles what chicken nuggets is to roast chicken, it is simply reconstituted “chocolate”. Cocoa beans should always be the first ingredient, not powder. Likewise, if other fats and syrups have been used instead of cocoa butter and dried sugars, for example using coconut oil and/or agave syrup, it is not real chocolate. Does the label tell you where the beans were grown and harvested? The key is to look for the name of an estate, farm, co-operative or farmer. Transparency is key. Be wary if it just says, “percentage X” or “country Y”- that isn’t actually telling you the origins of the beans at all. Also remember that percentage is only an indicator of the amount of cocoa solids in a bar, it is not an indicator of quality. Bars that give this type of vague information will never be able to provide the same tasting experience as a craft chocolate bar, nor will it provide the same transparency in sourcing of its ingredients, so put it back. 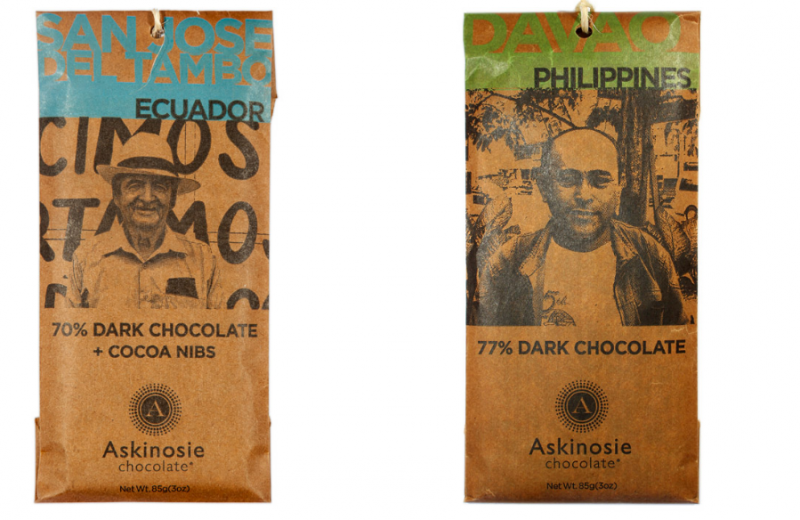 Look at these bars from Askinosie, it shows us right on the very front of the label the regions (not just country) where the beans were grown. Askinosie also shows us a picture of the actual farmers who grown and harvest the cacao. Look for details of the maker, and if you can’t see an address – think again. Also, don’t be fooled by the “branding” of some countries, for example Swiss or Belgian chocolate. This doesn’t really mean anything, as there is no legal regulation of the use of these terms. Under EU law you don’t need to say where you create (grind, refine and conche) mass produced chocolate, so it’s possible that your “Swiss” or “Belgian” chocolate might be mass-manufactured outside its inferred country. In contrast, Menakao, for example, produces its chocolate in the same country as where it sources its cacao from – Madagascar. Working like this provides a substantial economic benefit to the communities in the country of cocoa origins, as the cocoa value chains are reduced and enriched. Fermentation – how many days? How many times are the beans turned? Roast – is it light, medium or dark? Is it drum-roasted? Grind and Conche – how long for? Batch information – what size? What number? Is it a limited edition? Vintage – what is the harvest? How long has it been aged for? On a side note, one thing to be super sceptical of is if a bar says “raw”. “Raw” chocolate should only be used to refer to cacao beans that have not been roasted (or simply flash-roasted). During fermentation of cacao and during the grinding and conching processes of chocolate making, temperatures will reach well above what is considered “raw”. The choices you make when buying a chocolate bar have far greater consequences than you might imagine. Whilst mass-produced chocolate has its dark side – multinationals fined over slavery and child labour – craft chocolate, in contrast, paints a very different picture. Craft makers are keen to share the work they do to help those farming the cacao at origin. Their websites often include transparency and sustainability reports and we’re seeing an increasing number of makers make mention of their efforts on their packaging. For example, buying a bar of Original Beans plants a tree in the rainforest. Or look at Askinosie, who profit shares with its cacao farmers, dependent on the sales of products made with those beans, which in turn encourages farmers to produce the highest quality cocoa beans. If when you pick up a bar and it costs less than say £3-4, it’s probably remoulded from mass-produced chocolate (maybe even remoulded “Belgian” chocolate), rather than being crafted from bean to bar. At that kind of price, its flavour (or lack of) will more likely come from additives than from being coaxed from rare and awesome beans. If the price is suspiciously cheap (say less than £3 per 100g), someone must be paying for it somewhere else down the line. But it’s also worth noting that paying top dollar doesn’t always equal top quality. Beyond our five point checklist, one other set of suggestions for customers and makers (hat tip to Sharon Terenzi) is to make allergen and dietary information super clear. Sadly not all customers realise that, for example, dark chocolate bars are vegan as they don’t contain milk. Similarly, it’s worth reassuring customers if a bar is gluten free. So, if you pick up a craft chocolate bar that, for example, contains just: cocoa beans, sugar and cocoa butter, yes it is DAIRY FREE and yes it is GLUTEN FREE. All plain dark chocolate bars should be dairy and gluten free. If you’re in London this weekend, join us on Saturday at Uppers & Downers, afestival of coffee beers in Hackney. Uppers & Downers began in 2013 as a conversation between Good Beer Hunting’s Michael Kiser and World Barista Champion Stephen Morrissey about the lack of creativity and sophistication in coffee beers. Fast forward five years and Uppers & Downers has grown into a series of immersive and collaborative coffee/beer experiences. Last year, Uppers & Downers made the leap across the pond for it’s first eventin London, and this year the event has grown to feature more brewers, moreroasters, and more chocolate! We’ll be setting up shop in Mick’s Garage in Hackney Wick, on Saturday May19th from 12pm – 5pm. This awesome venue is just a stone’s throw from theOlympic Park, and the event promises to be lots of fun for both coffee and beer fans alike. Last weekend I was invited to the World Cocoa Conference in Berlin to speak at one of the “warm up” sessions of the Fine and Flavour Forum. So first and foremost, I’d like to thank Martin Christy for inviting me, and congratulations to Martin and Maricel for arranging a raft of great speakers and topics on Sunday. Having said this, my overall impression for the World Cocoa Conference was one of bemusement and concern. I was expecting delegates to have passion and enthusiasm for our “product” (i.e. chocolate, food of the goods). And I was hoping to taste lots of chocolate. I did taste a couple of great chocolates (spoiler alert Fu Wan’s new tea infused bars are awesome), and I did manage to listen to (and even speak with) a few forward thinking individuals (thanks Carla for the intro to Volta’s Anthony Rue, good to finally meet Nick Weatherill of ICI, and I enjoyed meeting Starbucks people too). 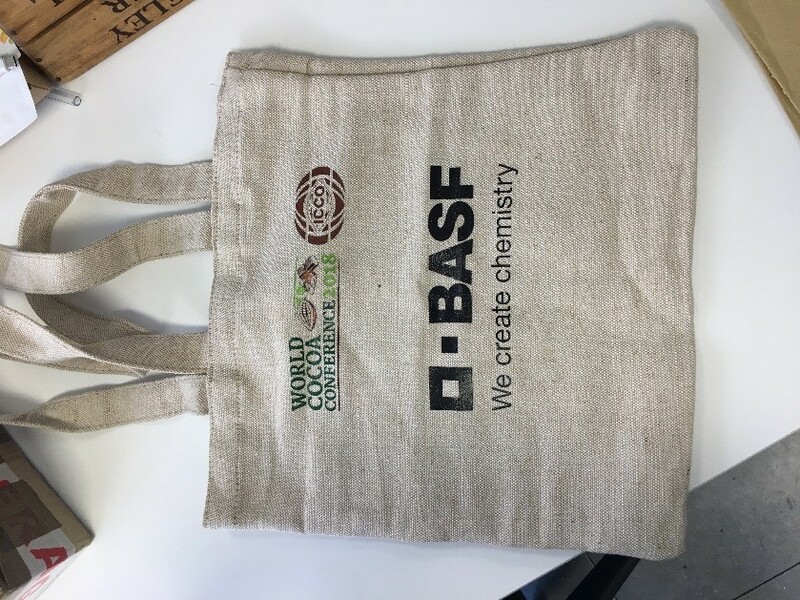 But there was hardly any chocolate to taste (two small bits of milka in the delegate bag) and my overall impression was that at best most delegates didn’t really take pride in, believe in, or aspire to create (or taste) great chocolate (hint – take a look at the tag line on the delegate bag below from BASF – “we create chemistry”). Delegates and participants all too often seemed overwhelmed by the problems of their world and industry – deforestation, climate change, poverty, child labour, blight, consumer mistrust, health concerns, to just name a few. Unlike attending speciality coffee fairs, wine shows, craft beer shows or even craft chocolate shows there was no sense of passion, pride or purpose. My panel, made up of Jorge Redman, Mikkel Friis Holm Luis Mancini and me, was on lessons Chocolate can learn from Speciality Coffee. We all agreed on many similarities – Mikkel focused on the importance of taste and consistency and Luis did a great job of noting the similarities of farmers and craft makers working together with both beans. We also acknowledged the huge boost that speciality coffee stores and baristas have had in promoting speciality coffee. We were all envious of the relative ease by which consumers can “upgrade” their daily habits of making morning coffee and visiting better coffee stores. By contrast craft chocolate isn’t an easy substitute for the mid-afternoon sugar rush realised with supermarket bars. We were optimistic on how craft chocolate can work with speciality coffee stores to sell bars and better drinking chocolate. But with hindsight what I wished I’d said (or rather shouted) was something along the lines of “come on guys, wake up smell the coffee” – look at what the (speciality) coffee industry has done for consumers, farmers and themselves over the last decade. Sure speciality coffee may only be 8-15% of coffee sales – and craft chocolate is still less than 1% (definitions and statistics are slippery, but these seem “directionally accurate”). My impression of folks within both the mass and speciality ends of the coffee industry is that they have a sense of purpose and pride for their product and industry. They believe coffee can (and should) taste great. They can get customers to appreciate and enjoy coffee. They can improve some farmers lives. They can and should plant forests, work with local governments and associations. This is in marked contrast to Big Chocolate. The end point of a supply chain that pays farmers less than half of what they need to live, beggars their families and gives them very little hope (although it’s better to be in Ghana or Cote D’Ivoire than war torn Liberia). More worryingly no one was proposing any viable solutions. There was an appeal to “cathedral thinking” (i.e. thinking of the future for your grandchildren) and a truly bizarre story from a Canadian guest speaker about New College, Oxford planting a forest in 1378 so that when the college hall (sic) was rebuilt in the 1970s they could harvest some trees planted in 1378 by the great, great grandparents of the current new college forester (I’m not making this up). There was some talk of “responsible partnerships” and Simran Sethi showed what can be done by the likes of Tony Chocolonely in the world of sustainable production. But much of the time I had to pinch myself when I heard more and more appeals to government, and in particular the EU, to “do something”. There were lots of interesting statistics – and the chart from the ICCO showing that whilst the world weighted price of 1 KG of chocolate has held constant or even marginally increased from $14.22 to $14.7 between 2013 and 2017, the price of 1KG of cocoa beans (nearby futures contract New York) has decreased from $3.20 to $2.04, pretty much summed up the challenge. For Big Chocolate, chocolate / cocoa is a commodity product and Big Chocolate isn’t interested in fine flavour or taste. Unlike other commodity products such as, for example oil, governments, farmers and traders in cocoa growing countries find it really hard to co-ordinate on a local or international level. Despite two countries controlling 65% plus of world cocoa (Cote D’Ivoire and Ghana), their governments are not incentivised and indeed often relatively powerless to impact prices. The majority of the cocoa growing comprises a myriad of small cocoa farmers, traders, loan sharks, etc. who operate on the edges, and often outside, the law (check out all the cocoa being farmed illegally in national parks). I’m no expert here, but I can sympathise with the argument that it’s far easier to e.g., monitor sweatshops producing garments than certify these supply chains. It can be done in chocolate. Divine have done this in Ghana, Ritter explained what they are doing, and there are lots of initiatives in Ghana, Cote D’Ivoire, etc. and NGOs like the ICC who have laudable plans. And coffee shows that there are alternatives to OPEC like structures. So instead the ICCO is now arguing that governments, and in particular the EU, “take action”. One keynote speaker even argued that because government taxes took up 15% of the $100bn spent on chocolate globally, governments should use this to subsidise farmers wages and pay more for cocoa beans (I may have misunderstood this … but checking with a few others in the audience, this was their impression too). Mighty Earth made a similar plea for the EU “to get involved” and “take action” (everyone did seem to realise that Trump wasn’t as obvious a lobbying target). In the US there were similar efforts to label, and put limits on, cadmium in chocolate – especially in California. However, these initiatives appear to have been met with some labelling compromises and “further studies”. The Peruvian, Ecuadorean and Columbian governments are all making desperate lobbying efforts to stall the EU’s plans. But there isn’t a lot of time left, and a lot of Ecuadorean, Peruvian and Colombian cocoa farmers and makers are about to get thrown under the bus. I’m very grateful for the chance to attend the conference. And as I said at the outset, I wish I’d taken my chance to rant during my speech and have participants from Big Chocolate taste some really great craft chocolate that Martin’s International Chocolate Awards, the AOC and indeed our monthly subscription boxes celebrate. But hindsight is frequently 20:20. Next time! Looking forward, I’ve come back worried about the potentially disaster that EU Cadmium regulations will have for many Peruvian, Colombian and Ecuadorean farmers and makers without anyone really noticing (as a side note, it’ll be interesting to see how “raw” chocolate handles this given that so much of the liquor from which it is processed comes from Ecuatoriana, a single large Ecuadorian factory. Perhaps “raw” consumers will now examine these raw bars, and the fiction of raw chocolate’s health benefits, a little more). At a minimum it’d be good to have more time for cocoa growers and farmers to work out how to test for cadmium. Above all I’ve come back even more unimpressed by “Big Chocolate”. Big chocolate is bad for the farmers, bad for local forests and bad for the planet. Consumers – correctly – are mistrustful of Big Chocolate and their processes. And Big Chocolate knows this – and I’m really not surprised why Big Chocolate is so embarrassed and why it has no pride, passion and plans for Theobroma Cacao, the fruit of the gods. There is almost a case to be made for a cocoa blight, like Witches Broom, to strike and help raise prices through a shortage – and force big chocolate to think more long term, force a restructuring of the industry etc. But short term this would be terrible for the already beleaguered farmers and their families in West Africa. Instead, I think we have to learn more from, and follow in the footsteps of, speciality coffee, artisanal cheese, and craft beer. In the UK more is spent buying chocolate than purchasing either books or music. But this chocolate expenditure isn’t, yet, the subject of much enthusiasm; Big Chocolate is unsurprisingly reticent of its supply chain and processes. By contrast, craft chocolate lovers and makers are enthusiasts. We celebrate the cocoa bean and the bars craft chocolate makers create. We know craft chocolate tastes better (a LOT better). We know craft chocolate is better for you (has less additives, you’ll savour it more and scoff less – so hopefully eat less of it, etc.). And direct trade is clearly far better for farmers and the planet. We know just have to persuade more and more consumers, and who knows even some members of “Big Chocolate”, to try craft chocolate and pick up our passion, purpose and pride. To that end, we’re working to create some Craft Chocolate Fairs – the first at Kings Cross Canopy Market over the weekend of May 11-13th, and then another at Square Mile Coffee Roasters from October 19-21st. For more details see cocoarunners.com/events/ – and hope to see you there! As spring is finally beginning to make itself felt here in the UK, we have selected four chocolate bars full of a wonderful mix of flavours that we are sure will bring a little sunshine to your taste buds. And as the season changes, what better way to celebrate than with a mixture of the old and the new? This month we have some truly fabulous new bars from makers we’ve come to know and love of the years, and who prove to be perennially popular in our Cocoa Runners Library. We also have a new maker to introduce who we have been speaking to for some time and are delighted to finally be able to give you a taste of his delicious chocolate. Of course we at Cocoa Runners are always looking to improve and increase our chocolate selection, and it’s not always possible to include every single new single-origin bar in our monthly box. So if you like the bars we’ve selected for you, we urge you to check out the maker’s other bars and everything else that’s new on site. And of course if you’re looking for a recommendation, simply drop us a line via email, or on Twitter, Facebook or Instagram and we will be happy to help! We hope you enjoy this month’s selection. We first met Paco Llopis of Utopick at the Salon du Chocolat in Paris two years ago. Since then we’ve been chatting, exchanging chocolate and working hard (particularly Paco, his team and his business partner/wife Juanas Rojas) to bring you this bar. The beans for the bar we’ve chosen began their journey in the north of Guatemala, in the tropical rainforests located in the natural park that surrounds the pristine paradise of the cenote Lake Lachuá. This is a bountiful region, also producing harvests of fragrant cardamom and coffee. When it comes to the cacao, there is a particularly rich range of varietals, which give the chocolate its wonderful blend of flavours. The Qeqchi Maya families that live in the region cultivate cacao beans in a rigorous Transparent Trading model, which secures prices for the cacao for producers that are even higher than Fair Trade, whilst ensuring responsibility and accountability at every stage of production. You can try Utopick’s Dark Chocolate from this month’s box here, and find the rest of Utopick’s bars in the Chocolate Library here. Next we’ve a new bar from Barcelona-based Blanxart. A few years ago, we tasted a bar from Blanxart which blew us away with incredibly ‘chocolatey’ flavour (there is no other way to describe it). Since we introduced this bar to you it has become one of our most popular dark chocolate bars. And now the artisans at Blanxart have come up with a new twist on this old favourite. This bar is a darker, more intense version of the Dominican Republic 70%, using a new recipe and slightly different beans, giving a similar yet highly distinctive flavour. When it comes to chocolate, Blanxart has years of experience to help them craft its bars. Making chocolate since 1954, today Spanish maker Blanxart remains faithful to its origins; is uses the same logo and its production is overseen by fourth generation master chocolatier Xavier Cordomi. Like his forefathers, he has passion for chocolate and a meticulous eye for detail. The high quality of Blanxart’s chocolate is a reflection of this constant search for improvement and the many hours of training its staff put in. You can try Blanxart’s Dark from this month’s box here, or you can find the rest of Blanxart’s bars in the Chocolate Library here. Next we have a dark chocolate from one of Venezuela’s oldest and most renowned chocolate families. he Franceschi family has been growing and exporting Venezuelan cacao since 1830. On the family’s farm in the Paria Peninsula of Venezuela, they grow a number of rare Criollo varietals. These are genetic strands of cacao unique to Venezuela but famous across the world for their unique and delicate flavours. Thanks to its farm and links to other farmers, Franceschi is doing a lot of work to protect these rare varietals. The Canoabo bean used in this bar is a Criollo varietal, which originates from the south of the Maracaibo lake, in the foothills of the Andes. It is from this region that Criollo varietals have propagated to the humid coastal areas, with Venezuela today boasting more than thirty different types of Criollo. So, when Franceschi proudly declare Venezuela the birthplace of extra fine cacao, offering the broadest range of flavours and aromas, it is a claim far from lacking in substance. You can find Franceschi’s Dark from this month’s box here, or you can find the rest of Franceschi’s bars in the Chocolate Library here. For the milk chocolate aficionados, we have a wonderful new treat from Cornwall’s Chocolarder. Chocolarder is the creation of former Pâtissier, Mike Longman, who began his bean-to-bar journey after committing to make as many of his own ingredients as possible. You can find Chocolarder’s milk bars here, or you can find the rest of Chocolarder’s bars in the Chocolate Library here. And for those who like to keep things dark, we’ve a beautiful bar from French chocolate experts Pralus, made from some of the finest Madagascan beans. The sleepy, picturesque commune of Roanne in the Loire valley provides the romantic backdrop that you might expect for the workshop of a legendary chocolatier and chocolate maker. Founded in 1948, Pralus originally earned international repute under celebrated pâtissier, Auguste Pralus, whose ingenuity concocted the enchanting creation of the Praluline, a brioche strewn with nuts caramelised in rose sugar. It was a creation that earned him the title of Meilleur Ouvrier de France and the French Order of National Merit. But when son François took over the family establishment in 1988, the spirit of innovation burned brighter still, as an initial interest in chocolate came fully to fruition when François became one of France’s first bean-to-bar chocolate producers. Today, Pralus’ single origin chocolate adventure has even extended to its very own plantation amid the tropical climes of Madagascar, where the beans for this bar were grown! You can find Pralus’ dark bar here, or you can find the rest of Pralus’ bars in the Chocolate Library here. This May, we are collaborating with Canopy Market, the weekly independent market at King’s Cross, to host a one-off celebration of all things cocoa for a weekend of total sensory pleasure. From the 11th – 13th of May, Canopy will host a dedicated chocolate market packed with the best craft chocolatiers, tastings, talks and demonstrations, all under the market’s beautifully restored Victorian glass and steel roof. A series of chocolate tastings led by the chocolate producers themselves will give visitors the opportunity to learn about and try a range of chocolate, as well as explore its versatility with sessions on themes such as chocolate and beer and chocolate and wine pairings. Jenny Linford will be speaking about the role played by time as The Missing Ingredient in craft chocolate. Matt Lindley will be speaking about craft chocolate makers in the UK and his new book, Bean to Bar Britain, while Ruth Spivvy, Founder of Wine Car Boot will be hosting a chocolate and wine pairing session. Brett Beach from MIA will be speaking about the opportunities (and challenges!) of crafting chocolate at origin and Pablo Spaull will be leading us on a chocolate meditation. Access to the festival is free of charge, and you can buy tickets to any presentation (priced from £5) at Cocoa Runners on Eventbrite. Cocoa Runners and the IICCT will also have stalls across the weekend. The chocolate special will take part alongside the regular market, featuring street food from Arancini Bros, Growlers and The Big MELT, a craft beer bar, English Wine and Italian Natural wines, artisan food producers and craft traders including Earl of East London’s hand-poured scented candles, unique handmade jewellery from Nabi London and Turkish hammam towels at Pur London. The chocolate makers in this month’s box have chosen cacao fromspecific regions with unique micro-climates. Here cacao beans growwith flavour profiles that cannot be found anywhere else in the world. First is a new bar from Luisa Abram. Luisa is dedicated to finding Brazil’s rarest cacaos, mostly grown by remote Amazon communitieswho can only be reached by boat. This new dark is no exception anduses cacao from the Rio Jari region collected during the 2017 harvest. Next Chocolate Tree has used cacao from a single Venezuelan region. The bean grown here is Venezuelan Porcelana, a varietal unique tothe country which is hugely prized by chocolate makers worldwide. Then, Rob Anderson from Fresco is one of two chocolate makers inthe world to have these beans, grown by a new association ofsmallholder farmers in the Polochic Valley. It is a delight to be able toshare this with you. Finally we want to introduce a new craft maker Lapa-Lapa. Founder Pieter-Jan is a Belgian now living and making chocolate inNicaragua. He is currently just using one type of bean, Rugoso, whichgrows in the jungles of Matagalpa. We hope you enjoy this selection. The dark chocolate has a green, almost earthy aroma. However on first bite, sharp notes along with strong honey and hazelnuts are revealed. The richly indulgent cocoa finish is topped by a toasty malted touch. The cacao used in this bar is a wild cocoa grown in the Rio Jari region, and formed part of the 2017 harvest. Luisa Abram, the founder and namesake was our first Brazilian chocolate maker. Luisa, her father Andre, and the rest of her family all pitch in. To make her bars, Luisa uses wild cacao sourced from small cooperatives in the upper basin of the Amazon. To the beans she adds nothing but a little organic sugar, giving the true flavour of Amazonian cacao. flavours linger on the tongue. Typical berry flavours of Madagascan cacao are blended with sweeter touches of caramel and fudge. The milk gives a rich creamy texture. Ali and Friederike of Chocolate Tree craft all their bars in their workshop just outside Edinburgh. They are dedicate to working as closely with their suppliers as possible. In 2015 they went to Madagascar to visit Bertil Akesson who owns the Ambanja farm near the Sambirano River in Madagascar. Working closely with the people growing their cacao ensures that they are paid a fair wage. This kind of rainforest agriculture also promotes biodiversity. Fresco is one of just two chocolate makers to use these rare Guatemalan beans. The beans are grown by an association of 500 smallholder farmers in the Polochic Valley, one of the hottest micro-climates in Guatemala. As well as cacao they grow coffee and produce honey. The Valley is right next to La Reserva de Biosfera Sierra de las Minas, a forest reserve, which the farmer association is also responsible for protecting. This powerful dark bar balances acidity, bitterness and sweetness. It has notes of sharp berries and stone fruits which blend in the finish with tropical wood, smoked tea and aromatic tobacco. An intense chocolate that lingers on the tongue. Belgian Pieter-Jan’s lifelong passion for chocolate had taken him far from home. Seeking out the best cacao to make the best chocolate, he found himself in Nicaragua where he now makes his bars from local beans. The name Lapa-Lapa comes from his Nicaraguan legend about a mysterious being called the Lapa-Lapa. This individual roams the jungles and hills of Nicaragua every night searching for the best quality cacao. Welcome to our February 2018 Collection. Every month we want to continue to bring you the best selection of new, world-class craft chocolate bars, so that you can delve deeper into the world of artisan, single-origin, and small-batch chocolate. This month we’ve selected three bars from some of the exciting makers in our Library and we also have a new maker to introduce you to. Beginning with the new, we would like to welcome MIA chocolate to Cocoa Runners. MIA stands for ‘Made in Africa’ and the bar not only uses Madagascan cacao and local ingredients, it is crafted the country too. MIA has just launched so we are really delighted to share these bars with you. Next we’ve a dark from Belvie. Marc and Jannie of Belvie work with farmers across different Vietnamese provinces to create the best possible chocolate. Like MIA, Blevie makes its bars at source, but in Vietnam not Madagascar! Then we’ve a bar from Domori. The Italian chocolate maker was one of the first to start sourcing its own beans and crafting its bars according to each origin’s flavours. Today Domori is renowned throughout the world. Finally we finish closer to home with a bar crafted in the UK by Pump Street. The cacao comes all the way from Ecuador to Orford in Suffolk where Chris, Joanna and Rob have crafted it into their signature buttery chocolate. We have known Brett Beach for years, since he was one of the founding partners of Madecasse. Late last year we met up with Brett to find out more about his new adventure. He is still committed to creating delicious chocolate at source and giving back to the local communities as much as possible. Brett has started a new food company which, although he has kicked off with a chocolate, he hopes to extend to other craft foods made at origin. MIA stands for Made In Africa. Just launched at the end of 2017, the company is dedicated to sourcing ingredients and making its chocolate at source to help local communities. On top of this MIA has created its own African community programme 1 for Change. MIA is donating 1% of all sales to the programme which is investing in local development projects to improve the whole community’s livelihood. You can try MIA’s Madagascan Dark Chocolate from this month’s box here, and find the rest of MIA’s bars in the Chocolate Library here. We began working with Belvie last year, after we received an email from Jannie out of the blue. While the number of craft chocolate makers is still growing, it is always a pleasure to discover new bars. And when the bars taste as good as Belvie’s and the beans have been as carefully sourced, our pleasure only increases! And when Belvie’s talent was recognised at the Academy of Chocolate Awards 2017 who can blame us for being truly delighted. Marc and Jannie of Belvie have always described themselves and being ‘chocolate addicts’. In the beginning, they made their own chocolate just at home until they wanted to share their passion with the rest of the world, and that is when Belvie was born. Their chocolate is a combination of Belgian technology, in-depth chocolate knowledge, incredibly self-sourced beans form Vietnam and their love for chocolate. The chocolate bar included in this box won Gold at the Academy of Chocolate Awards 2017. You can try Belvie’s Lam Dong Dark from this month’s box here, or you can find the rest of Belvie’s bars in the Chocolate Library here. Domori have become something of a household name in chocolate, and particularly in its native Italy. Since Gianluca Franzoni started the company it has grown and grown, selling an ever-increasing variety of chocolates and confection. But despite this success, Domori has stuck to its roots and continues to work with individual farmers and growers to produce its range of single-origin bars. Domori’s Tanzanian bar uses cacao from the Kokoa Kamili cooperative in the Kilombero Valley. Before founding Domori, Gianluca Franzoni spent three years in Venezuela. Here he worked with the cocoa harvests, studying the different cocoa varieties and trying to preserve some of the rarest varieties cocoa beans. This passion for quality beans and natural ingredients is the core of Domori’s philosophy. You can find Domori’s Tanzania Dark from this month’s box here, or you can find the rest of Domori’s bars in the Chocolate Library here. One of the first people to start crafting chocolate from the bean in the UK, Pump Street are now making a name for themselves across the pond too. Still based in Orford, Suffolk, Pump Street is always experimenting with new flavour inclusions and origins. And we are always excited to see what the team will come up with next. The father and daughter team of Chris & Joanna Brennan set up Pump Street Bakery originally as a sourdough bakery in 2010. Four years ago they began experimenting with craft chocolate, partnering with Rob Sledmore (an ex-Tank commander). Pump Street has won numerous awards in the UK and across the pond. For this bar, Chris sourced the cacao from his friend Samuel von Rutte. Sam runs the Hacienda Limon farm in the Guayas Basin in Ecuador and is famous for his studies of the genetics of Nacional Arriba cocoa beans. You can find Pump Street Chocolate Ecuador bars here, or you can find the rest of Pump Street Bakery’s bars in the Chocolate Library here. The International Institute of Chocolate and Cacao Tasting has created a one-of-a-kind, 3 Level educational programme for chocolate lovers. The courses are an intense excursion to develop an understanding of fine chocolate and its flavour possibilities. Begin with Level 1, your foundation in one day. Move onto Level 2, a three day course building on your knowledge. Finally, Level 3 courses are held in cocoa growing countries, with the opportunity to literally learn in the field. Develop the skills to evaluate, appreciate and really enjoy fine chocolate; these courses are perfect for anyone with a passion for the new world of fine, craft and origin chocolate. These courses take place around the world, and the IICCT currently has confirmed dates for upcoming courses in London, Copenhagen and Amsterdam. A full list of upcoming dates is below, but to find out more about the course structure and content, and to book your spot on a course near you, please visit the IICC website today. Today we present you with a chance to taste three single origin craft chocolate bars from Madagascan maker Menakao for just £5.95, or six for £10*. Make it many of the chocolate lovers who join us at our tasting evenings remark that they think they’re such great value. They loved being able to taste a little of a lot of bars, before buying a whole bar without having the chance to taste it first. We love hosting tasting events and sharing new bars with chocolate lovers, but we know that not everyone can join us in London (and so we are trying to do more outside of London in Manchester and beyond, but even then it’s never going to be feasible for everyone). This made us sit up and think: how can we do to bring this taster experience to you to enjoy at your leisure, in your home? With that in mind, we have curated two taster boxes, each contains a selection of taster bars from Madagascan maker Menakao. These individually wrapped, petite bars are just the size to enjoy with a coffee, and make the ideal gift to give that friend who you’ve been meaning to introduce to the world of craft chocolate. Menakao is a very special maker in that it crafts the beans in the country they are grown. It is unusual in that it not only uses Madagascan cacao, but also crafts its bars in the northwest of Madagascar. Its bars are superb examples of Madagascan dark and milk chocolate, simply bursting with sharp red berries and citrus. We love Menakao’s plain milk and dark chocolate bars. In addition Menakao also makes some outstanding flavoured chocolate bars. These bars showcase the distinctive flavours that can be achieved when Madagascan cacao is combined with locally sourced inclusions. Inside these collections, you will have the chance to try bars with peppercorns, chilli, Arabica coffee and fleur du sal. This box featuring three taster bars from Menakao is an excellent introduction to the world of craft chocolate, with a particular focus on Madagascan chocolate. Inside this box you’ll discover three craft chocolate bars from Menakao. 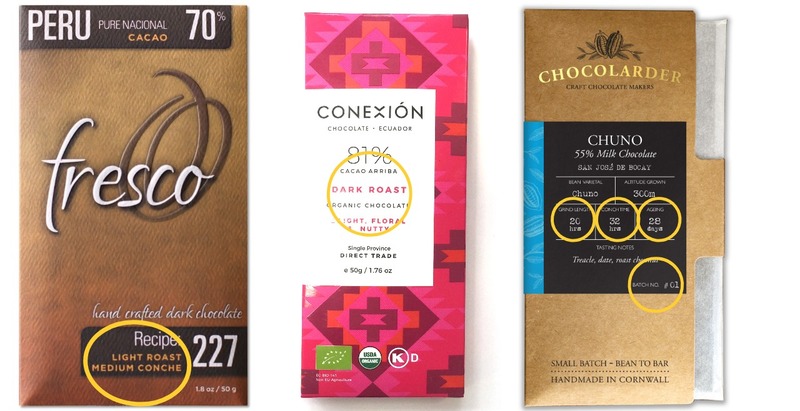 A plain dark chocolate bar, a bar with pink peppercorns and a bar with Arabica coffee, cocoa nibs and sea salt. At just £10 this pair of boxes is exceptional value. The first box contains a plain dark chocolate bar, a bar with Pink Peppercorns and a bar with Arabica coffee, cocoa nibs and sea salt. The second has a plain dark chocolate bar, a bar with bird chili and one with cocoa nibs and salt.